The Curly Wirly Twirly Girlies: Yeah - got to do some scrapping ! Yeah - got to do some scrapping ! I absolutely loved checking out the apprenticeships challenges going on at Little Dreamer Designs and Purple Paper Flowers recently. These ladies amazed me at how creative they could be when put on the spot. It was better than reality TV ! Susan Fitch's week 3 entry at LDD just grabbed me as soon as I saw it. It was so different and fabulous. As soon as I saw the little howlers I knew the layout I wanted to do. 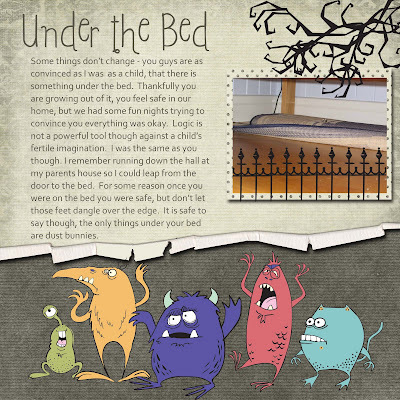 I don't know about you, but as a kid I was always scared of "something under the bed", and my kids went through a phase of this recently too. I used to run all the way down the hall at my parent's house when I was around 7 or 8 then leap from my bedroom door on to my bed. For some reason once you were on the bed you were safe - unless you dangled your feet down LOL. Go figure, logic had little to do with it. So recently I remember trying to logically explain to my kids there was nothing under the bed, we shone the torch, and I remember saying the only things under there were dust bunnies. I wanted to capture this memory for my kids, it is one of those moments that shows you the circle of life, and maybe one day (if we are lucky) they will be telling their kids the same story. And below is a hut for Pam LOL who is hopefully getting some sleep !